The elemental composition of some Ghanaian coins spanning from the years 1967 to 2007 have been successfully analysed using a newly installed 1.7 MV Pelletron accelerator at the Ghana Atomic Energy Commission. 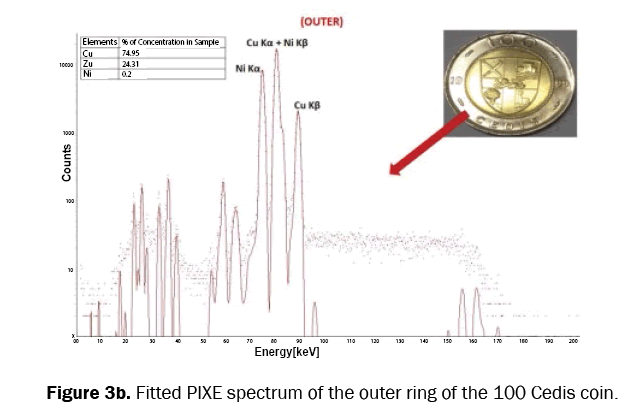 Using Particle Induced Xray Emission (PIXE) spectrometry, this study attempts to relate the major composition of these coins to the economic state of the country at the year of minting and also to validate the PIXE method used at the Centre. This work demonstrates that the Accelerator Research Centre has the capacity to analyse mintage coins in Ghana. Studying the elemental composition of coins does not only provide chemical information of the legal tender, but provide insight into the manufacturing processes, history and economic state of the country during the minting year of the coins. Physical examination of these coins is not always enough for accurate characterization. Particle Induced X-ray Emission (PIXE) technique has been used by many authors to determine the elemental composition of coins [1-7]. This can be attributed to its multi elemental capabilities, high sensitivity, fast and nondestructive nature. A newly installed Ion beam facility has been commissioned at the Ghana Atomic energy commission which is equipped with PIXE and RBS techniques and shall be utilized for this study. After Ghana attained independence in 1957 from the British, it introduced its own legal tender called the Cedi in 1965 to replace the old British pound. The Bank of Ghana has been issuing all Ghanaian coins and notes after its independence. Coins are linked to the daily activities of a country. Studying the chemical composition of coins provides the opportunity to connect the economic value of their metallurgy to the economic stability of the country at the time of cast and release [8,9]. This study seeks to address metallurgy elemental composition and evolution of coin minting technologies of ten Ghana coins spanning from 1967 and 2007 and also to test the capabilities of our newly installed setup to analyze coins. This study will also serve as a quality control measure to verifying the coin specifications given by the minting companies. The Coins analysed were pre-cleaned with distilled water and then acetone to remove all oil and other surface contaminants. Coins were then dried in open air. All coins were weighed using a balance. In-vacuum PIXE technique was used to determine the elemental concentrations of coin samples. The setup for the PIXE facility consist of a 1.7 MV model 5SDH-2 Pelletron accelerator manufactured by NEC, and an in-vacuum scattering chamber equipped with Particle Induced Xray Emission (PIXE), Rutherford BackScaterring (RBS), Elastic Recoil Detection (ERD) and Nuclear Reaction Analysis (NRA) capabilities. Target samples are positioned normal to the incident Helium beam with energy 3 MeV and collimated to attain a spot size of 2 mm. All samples inclu ding one (1) standard reference material SRM 1157 were irradiated at a beam current of 40 nA to attain a collection charge of 20 μC. The main detector for the PIXE analysis at our facility is a Silicon Drift Detector (SSD), with a Silicon crystal thickness of 0.28 mm and a Beryllium window thickness of 5 μm. The resolution of the detector is measured to be 180 eV at 5.9 keV. The detector is positioned in the chamber creating an angle of 45° to the sample holder (target). In-front of the SSD, a 58 μm Mylar absorber was placed to attenuate the background scattered X-rays peaks. Spectra acquisition and analysis were done with commercial GUPIX software (Figure 1 and Table 1) . Figure 1. Ghanaian coins used for this study. Table 1. Description of analyzed coins and their release year. The PIXE setup for metal matrix samples was validated by running a Standard Reference Material 1157 alongside the samples. Certificate values and measured values from this study are presented below. All concentrations are presented in weight concentration (%). From Table 2, all measured concentration values were below15% deviation from the SRM values and the authors can with confidence accept these results presented in this study as accurate and precise. Table 3 illustrates the elemental concentrations obtained from the PIXE analysis for ten (10) coins analyzed in this study presented in percentage weight. Table 2. PIXE analysis for NIST standard reference material 1157 using 3 MeV Helium ions. Table 3. Elemental concentrations for the 10 coins analyzed in percentage weight. Coin1 is among the very few coins released in the 1960's, when Ghana began issuing its own legal tender in 1965. From the PIXE analysis, coin1's metallurgy is mainly copper-nickel, thus 60% copper and 20 % nickel with a gross weight of 3.2 grams. Most analyzed coins minted in the 60's, 70's, 80's and the middle 90's had very high Cu contents. Aside the well- known fact about Cu as being less expensive, with antibacterial properties which make it a better candidate choice for coin mintage, it is also resistant to corrosion and wear, thus prolonging the life span of the coin. After almost ten (10) years after the release of Coin1, another Cu-Ni coin, Coin2 was released in the late 70's, but this time surprisingly the Ni content of the coin had been reduced to only 2.4% of the total metallurgy composition. It has to be noted that the world price for Nickel as quoted by the World Bank commodity price data, was far higher than Cu . The Metallurgy of coins as suggested by Khak et al 2012 can be connected to the economic state of countries during minting years . If this hypothesis is true, then the authors can attribute the reduction of the Ni content in the 1979 coin to the economic state of affairs of Ghana in the late 70's. The period between 1976 and 1986, can be said to be one of the hardest times in Ghana, with annual average inflation rates rising from single digits in the early seventies to a peak of over 100% in 1977. In 1978, a year before the minting of Coin2, Ghana was under a military government, and in that same year there was the devaluation of the Cedi and restrictive fiscal measures to reduce government expenditure. 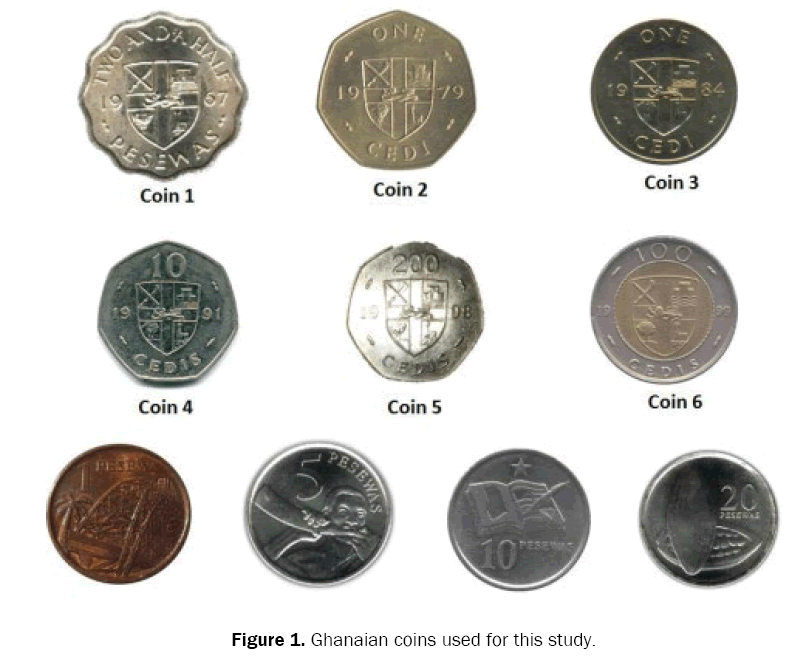 An attempt to link the Ni content of analyzed coins in percentage to the economic state of Ghana at minting years is illustrated in Figure 2. Another coin produced within this hard period (1979-1986) was the 1984 coin, called the ONE Cedi (Coin 3). This coin had the same name and value as the 1979 coin (Coin 2), but with further reduction in its Ni composition. Coin 3 had only 1% Ni composition as to a 75% Cu base. The authors also found it interesting the drastic reduction in the weight of this coin to 2.3 g as compared to its 1979 predecessor's 11.9 g weight. Figure 2. Nickel concentration and inflation percentage in minting years of analyzed coins. Coin4 was minted in 1991. It contained 87% Ni, 6.8% Fe and 2.5% Cu. In 1991, Ghana's economy was doing great, with foreign grants and robust economic policies put in place. World prices for Ni were still high . The introduction of Fe in the coin metallurgy in 1991 can be attributed to a change in minting technique adopted by the country at the time. The introduction of Coin6 raised lot of excitement among the populace as it was rumored to have contained high gold composition in its inner ring. This led to the hoarding of this coin by indigence. From this study, it was revealed that only trace amounts of gold was found in the core ~0.5 percent (0.5%), the major composition of the core of Coin 6 (100 Cedis) coin was 70% Cu, 22% Zn and 6% Ni which can be classified as brass. Brass is an alloy of copper and zinc and is harder, stronger and more corrosion resistant and has an attractive gold color. The PIXE spectra for this coin are illustrated in Figures 3a and 3b. Figure 3a. Fitted PIXE spectrum of the inner ring of the 100 Cedis coin. Figure 3b. Fitted PIXE spectrum of the outer ring of the 100 Cedis coin. Principal component analysis was employed to rigorously inspect and evaluate the variance present in the data obtained from PIXE analysis and to reveal any pattern present which can be linked to minting technique . SPSS statistical package version 21 was used for the study. The first principle loading, represents the maximum variance, followed by the second principal component loading, third, fourth etc. Eleven variables (Si, P, S, Cl, Cr, Mn, Fe, Ni, Cu, Zn and Ag) were used as the markers for discriminating the samples. The first three principal component loading as illustrated in Table 4, explained 86.64% of the total variance in the data set. Six (6) variables loaded fully on the first component, these variables are Si, P, S, Cl, Cr, Zn and Ag. Although Zn and Ag are sometimes used as the alloying materials in coin minting Si, P, S, Cl and Cr are mostly present as a results of alloying additives, impurities within the alloying materials or external pollution with dust incrust at the surface of the metal . From Figure 4, a plot of the second principal component versus the first principal component is shown; three (3) main coin grouping can be observed which is as results of minting methods or raw materials used for the minting process. The three (3) variables that loaded on the second component in Table 4, were Fe, Mn and Cr. Iron (Fe) based coins are very common especially when Mn is added for coin hardening. From Figure 4 the 1967 and 1996 coin thus coin 1 and 5 respectively were Iron based coins but with different minting materials and additives which explain their separation in the first and second quadrant of the plot. The third component had only Ni and Cu loaded fully. Cupronickel coins are known for their shiny surface and resistance to wear and tear. Most of the analyzed coins qualify as Cupronickel coins with varying Cu-Ni ratios but these are distinguished by their metallurgy which includes additives and impurities. The Cluster of all the 2007 coins in the third quadrant can be explained by similarities in their minting techniques and raw materials used. A cluster of the 1979, 84 and 91 coin also can infer similar minting technique or raw material utilized for the minting process. Figure 4. A plot of PCA2 versus PCA1 for coin samples. Table 4. Illustrates the Rotated Component Matrix for all coin samples. The elemental composition of ten (10) Ghanaian coins have been successfully analysed using a newly installed 1.7 MV pelletron accelerator using PIXE spectrometry. At the end of the study, the authors discovered that since 1967 to 2007, most of our coins contained copper and nickel as the major components with varying ratios depending on the year in question. The authors attempted to link the varying ratios of these two major elements to the economic state of the country at those minting years of the coins, since nickel is more expensive than copper. A relation could be found when the Ni contents were compared with the inflation figures at those times these coins were minted. Multivariate analyses performed on the data revealed three clusters, which can be attributed to minting techniques and raw materials adopted in the minting of the analysed coins. Most of the analyzed coins were Cupronickel coins with varying Cu-Ni ratios. Lastly for the first time the authors proved to the world that their newly installed accelerator has the capabilities for analysing metals, by performing a cross validation an NBS tool steel standard reference material 1157. We gratefully acknowledge the financial assistance from the International Atomic Energy Agency (IAEA), The Government of Netherlands and Ghana Atomic Energy Commission (GAEC) in the acquisition and setting up of the facility. Our thanks goes to the National Electrostatics Corporation (NEC) team who assisted in the installation of the accelerator. Special thanks to Aliz Simon and Margaret Mashinkila for technical advice and support throughout the whole project. Racz A, Heberger K, Rajko R, Elek J. Classification of Hungarian medieval silver coins using x-ray fluorescent spectroscopy and multivariate data analysis. Heritage Science 2013;1:1-9. Flament Ch, Marchetti P. Analysis of ancient silver coins. Nuclear Instruments and Methods in Physics Research Section B: Beam Interactions with Materials and Atoms 2004;226:179-184. Hajivaliei M, Mohammadifar Y, Ghiyasi K, Jaleh B, Lamehi-Rachti M, et al. Application of PIXE to study ancient Iranian silver coins. Nuclear Instruments and Methods in Physics Research Section B: Beam Interactions with Materials and Atoms 2008;266:1578-1582. Bugoi R, Constantinescu B, Constantin F, Catana D, Plostinaru D, et al. Archaeometrical studies of Greek and Roman silver coins. J Radioanal Nucl Chem 1999;242:777-781. Rousset M, Fedoroff M. Multielement instrumental neutron activation analysis of silver-copper coins. J Radioanal Nucl Chem 92:2005:159-170. M.A. Meyer, G. Demortier. Nonvacuum analyses of silver coins (9th to 15th century A.D.) Nucl Instr Meth Phy Res 1990;49:300-304. Smit Z, Semrov A. Early medieval coinage in the territory of Slovenia. Nucl Instr Meth Phy Res 2006;252:290-298. Fierascu R, Dumitriu I, Ion M, Catangiu A, Ion R. Surface and analytical techniques study of Romanian coins. European Journal of Science and Theology 2009;5:17-28. Vijayan V, Choudhury RK. 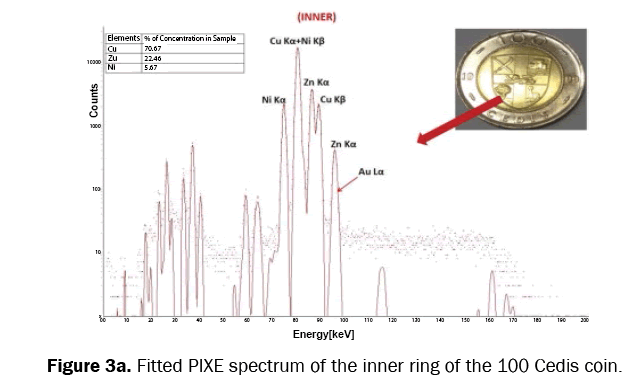 Analysis of Silver Coins By External PIXE, 10th International Conference on Particle Induced X-ray Emission and its Analytical Applications (PIXE) ,Portorož, Slovenia. University of Ljubljana 2004;302:1-302. Maxwell JA, Teesdale WJ, Campbell JA. The Guelph PIXE software package. Nucl Instr Meth Phy Res 1995;95:407. World Bank Commodity Price Data (Pink sheet), retrieved from https://knoema.com/WBCPD2015Oct/world-bank-commodity-price-data-pink-sheet-monthly-update?tsId=1000910. Khak P, Kouhpar M, Hajivaliei M, Khademi F. Elemental Analyses on Ilkhanid period coins by pixe: a case study on King Ghazan Silver coins. Mediterranean Archaeology and Archaeometry, 2012;13:83-88.